Scientists Keep Human Embryos Alive Longer In The Lab : Shots - Health News Scientists have been able to keep human embryos alive twice as long as before. The technique is reopening a debate over a rule limiting research on human embryos to 14 days. 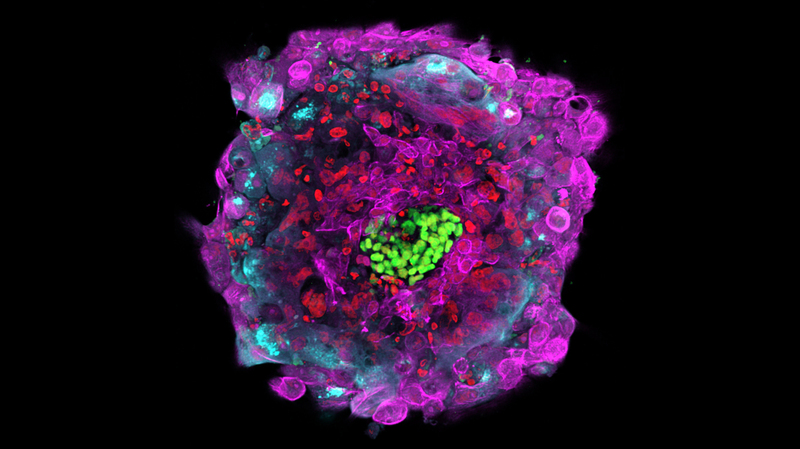 Molecular markers show structures and cell types within a human embryo, shown here 12 days after fertilization. The epiblast, for example, appears in green. Scientists have been able to make and study human embryos in their labs for decades. But they have never been able to keep them alive outside a woman's womb for more than about a week. That limitation meant scientists were unable to conduct a range of detailed research into early human development. But now researchers say they have discovered a way to keep human embryos alive in the laboratory about a week longer than ever before, and through a critical period of development. It's a step they say will yield important insights into human development and could lead to a better understanding of the factors that cause miscarriages and birth defects. "All of this research which we do in the lab should have enormous benefit," says Magdelena Zernicka-Goetz, a professor of developmental biology at the University of Cambridge in England who helped conduct the research. But the advance is reviving a debate about the ethics of conducting experiments on human embryos in the laboratory. Specifically, the move has raised questions about whether to change a long-standing rule that has limited research on human embryos to the first 14 days of their development. The research, published Wednesday in two papers in Nature and Nature Cell Biology, builds on a recent discovery by Zernicka-Goetz's group showing how to keep mouse embryos alive longer in the lab. The researchers developed a specific mix of amino acids, hormones and growth factors that "would allow embryos to feel as good as they would feel in the body of the mother," Zernicka-Goetz says. The next big question was: Would the same mix work to keep human embryos alive longer? Until now, the upper limit for human embryos was about seven days. Zernicka-Goetz's group and a separate team at Rockefeller University in New York decided to try. And it worked. Human embryos kept developing in the lab for about another week. Zernicka-Goetz says being able to go past the previous limit is "extremely important" from a scientific point of view. That's because the seventh day of development is the time when the human embryo becomes embedded within the body of the mother — when it becomes implanted in the womb. Scientists had thought embryos could only keep developing if they were safely in the womb and receiving instructions from the mother's body. But the embryos in the studies implanted in the dish as they would in the womb. Then they started organizing themselves into the very early stages of different complex organs and tissues and structures in the body, the researchers report. Different cells types are shown in an early human embryo, six days after fertilization. Cell boundaries are indicated in white, cells of the inner cell mass (which will give rise to the embryo proper) are in green, and trophoblast cells (which will give rise to extra-embryonic tissues) are in purple and magenta. "That was a big eureka moment in the lab," says Ali Brinvalou, an embryologist at Rockefeller University in New York. "All the information necessary and sufficient to have the embryo move forward is already contained within those handful of cells," he says. "That was a very big surprise to us and to the field." Researchers know relatively little about how a tiny ball of cells that makes up an embryo starts to become a complex human. It's been a complete "black box," Brinvalou says. "I find this to be alarming and I find it to be a bit embarrassing," he says, "because I know more about the fruit fly and the frog and the fish and the bird than I know about my own [human] development." The advance should help scientists investigate many long-standing questions, including: Why do so many pregnancies end in miscarriages? How could infertility treatments be improved? What causes birth defects? How do embryonic stem cells really work? "We will learn things we cannot even imagine," Brinvalou says. "It's as if you say: 'If I look at new sets of Hubble Space Telescope pictures that I haven't seen yet, what will I learn from them?' It's difficult to say until you look at them." Other researchers agree the advance is very promising. In a commentary accompanying the research, Janet Rossant of The Hospital for Sick Children in Toronto says the work could "provide important information" to researchers. And that leads back to the current status of the 14-day rule. "If there's no other way to retrieve valuable information that could be good for humankind, I think it's definitely worth discussing the possibility of renegotiating where that stopping point ought to be," says Insoo Hyun, a bioethicist at Case Western Reserve University. For those who think experimenting on human embryos is morally wrong, going even further is deeply troubling. "The 14-day rule has kept it pretty limited in terms of what scientists could do. Once that goes, then it begins to sort of say: 'It's open season on human embryos. Anything goes,' " says Daniel Sulmasy, a doctor and bioethicist at the University of Chicago. "The question has to be: 'Are there any limits to what we will do to human beings in order to gain scientific knowledge?' And then who counts as a human being?" says Sulmasy. The 14-day rule was established at a time when it was impossible to keep embryos alive in the lab even that long. In the current research, both groups of scientists stopped the embryos from developing past 14 days because of the long-standing rule. But the new work suggests they could have kept the embryos alive longer. The 14-day mark was also picked originally because it was thought that was about the time when embryos tend to form the "primitive streak," which is a structure that starts to give the embryo more of a structure and individuality. But Hyun argues in an article accompanying the new research that the latest advance means it may be time to rethink that rule. "Now there will be further questions about whether or not there would be good scientific reasons for moving that line out a little bit farther," Hyun tells Shots. "What is the purpose of the 14-day rule in today's scientific environment and do we want to keep it?" Hyun stresses, however, that any change to the 14-day rule would require the same kind of careful, coordinated international debate that created the rule in the first place, to satisfy moral qualms.